I really take delight in food that is served in small portions. Any cuisine that involves dining at a table full of small plates makes me happy. Whether it be Greece’s fresh mezze, Italy’s tasty antipasti, or Korea’s collection of delightful banchan (side dishes), I adore them so much that I make up entire meals composed of these little wonders. Enter tapas. 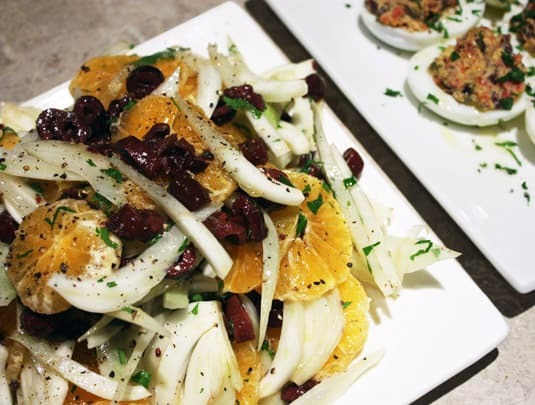 Some will say they’re less popular now than they were just a few years ago, but I continue to see menus featuring tapas appetizers or offering a large selection of small plates that you combine to form a meal, tapas-style. In North America, they are not as frequently served in Spanish restaurants as they are in fashionable hang-outs like lounges and cafés. Perhaps in as effort to make them as exciting as the sparkling and colorful martinis often offered on the same menus, tapas have been dressed and fancied up, at times to the point of resembling canapés more than authentic Spanish tapas. 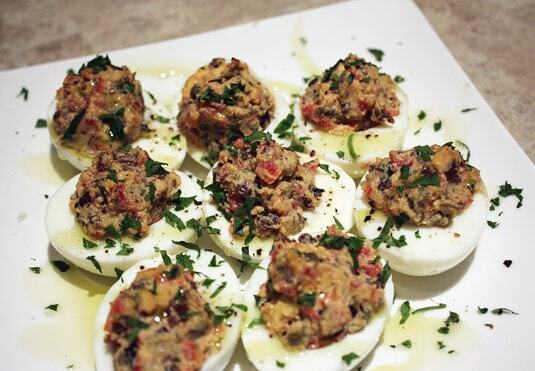 Personally, tapas used to be these fussy, fusion bites I enjoyed when I went out with my girlfriends. But that was before I traveled to Barcelona, where I discovered that authentic tapas are in fact a very down-to-earth affair. 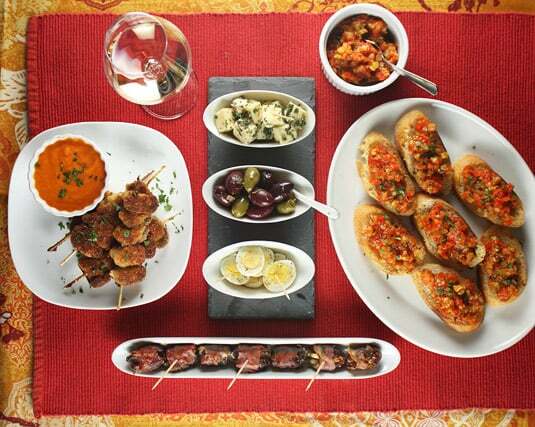 In Spain, tapas are more a way or manner of eating than they are recipes in particular. They often involve very little preparation, such as marinated olives, chorizo bites, cheese cubes, or sliced Iberico ham, but they can also be slowly-simmered stews served in portions. Basically, anything can be a tapa, as long as it’s served in a small plate. As Spaniards dine very late, (10PM and beyond), it’s comes as no surprise that they need to have a snack after work. As foreigners, the challenge is to enjoy tapas and still be hungry at dinnertime – a feat that I found nearly impossible to accomplish, as the array of small plates offered was so mouth-watering that I couldn’t restrict myself to merely one or two choices. This Christmas, my brother offered me “The Book of Tapas,” written by the authoritative mother-daughter duo of Simone & Inés Ortega, who are also behind the bible of Spanish cuisine, “1080 Recipes.” Leafing through the book brought all of Barcelona’s bold flavors rushing back to my memory. Very quickly, I found myself drooling over each and every one of the recipes, and at once, I just couldn’t stop cooking from the book. By now, I’ve been through dozens of its recipes, all with great success. They’re easy to execute and feature easy-to-find ingredients, which are often already stocked in my pantry. The fact that there’s such a diversity of dishes – from dips, to fried foods, to vegetarian dishes, to rice casseroles, to grilled meats – makes it easy to compose menus from the book, and that’s exactly what I did over the course of the holidays. I served some while having cocktails with friends, made an entire tapas meal for E and I, and assembled even more for our New Year’s Eve party. 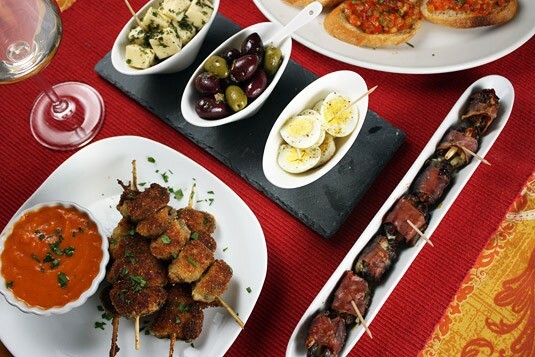 Over the course of little more than 10 days, I came to fully understand the worldwide popularity of tapas: they are an excellent way to sample many different things within one meal, allow diners to tailor the portions they eat exactly to their appetites, and best of all, they’re the ideal food to enjoy with friends and a good glass of wine. 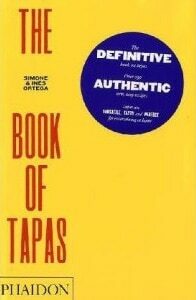 “The Book of Tapas” reflects Spain’s warm and inviting personality: it’s printed on yellow paper, the titles are bright red, and the pictures are styled very simply–just overhead shots of the simple plates laid over natural surfaces like stone or wood. Indeed, leafing through the picture pages immediately draws you into tapas-hour spirit with a glass of wine here, a half-eaten piece of bread there, or toothpicks carelessly scattered by the plates’ sides. The book is surprisingly short on the educational side but, in typical Phaidon minimalist and modern style, the authors decided to tell you everything you need to know by way of pictures. The table of contents, preface, introduction and glossary (to translate Spanish expressions and terms) are composed of fewer than 10 pages, and then visual education begins with a lavishly-illustrated A to Z of Spanish ingredients that spreads across 24 pages.By that point, you just want to start cooking, and the 378 pages of recipes and pictures that follow will guide you along, allowing you to accomplish exactly that. What I truly liked best about the recipes were the simple, straightforward instructions. 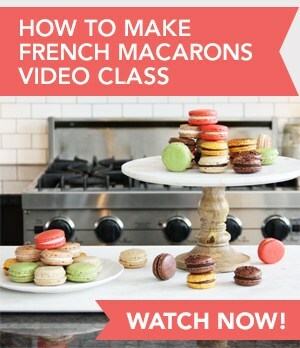 They are detailed enough to be easy to follow even by novices, but remain concise enough for most of the recipes to be presented in under one page. 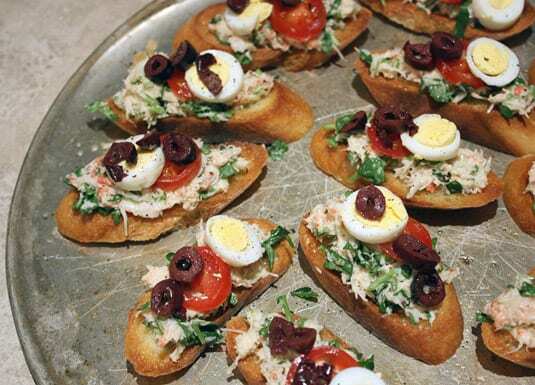 I love the frequent and creative use of hard-boiled eggs (best one was to top off delicate crab and watercress croutons) and the variety of fish and seafood recipes, both cold and hot (my favorite being the breaded mussel brochettes served with a zesty bell pepper sauce). The last section of the book may offer the most interesting recipes, as famous Spanish chefs like Albert Adrià and José Andrés (who also signs the book’s introduction) share their favorite tapas, all unusually easy to make considering they are chef recipes. To me, this just proves that tapas are first and foremost simple dishes that are meant to be enjoyed, rather than to impress. The book wraps up as concisely as it began, with a 1 ½ page directory and some recipe notes. Although pick and choosing recipes for a tapas’ night is fairly easy, I would have loved to see menu suggestions added to the book, grouping recipes around a theme or selecting dishes from a precise region of Spain, for example. Including further information about the origins of tapas would have also made a nice addition, but for that, I’ll just have to pick up another book. In the meantime, I’ll keep right on cooking my way through “The Book of Tapas”’ 250 recipes – after all, my taste buds don’t care about history, they are simply eager to enjoy the many delicious moments yet to come. 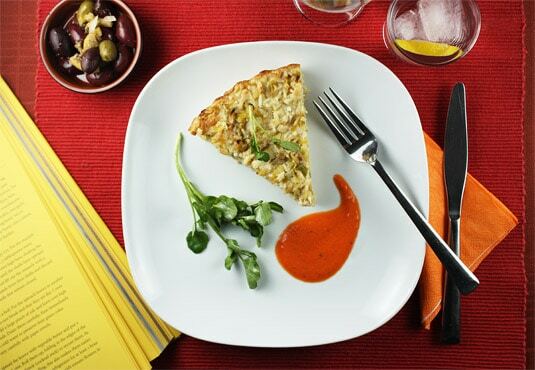 I’m sharing one particularly satisfying and versatile recipe from the book, a Spanish twist on the French quiche. The leeks are melted with onions and herbs in olive oil and then, white wine comes in to deglaze their caramelized goodness. The mixture is mixed with Gruyère cheese, eggs and white rice, to be cooked as a crust-less tart. My favorite part is the flavorful roasted bell pepper sauce that not only adds a splash of color to the plate but gives a boost of flavor as well. 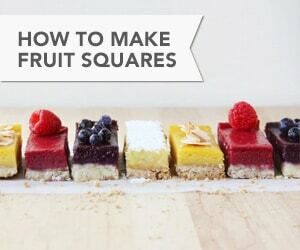 It’s great served as a main course, but awesome cooked in a square dish, cut in small bites and served topped with a spoonful of sauce on top. And it’s just as good hot from the oven as cold, the next day. Preheat the oven to 350°F (180°C). Brush an ovenproof dish (round or square) with oil. Heat the oil in a pan. Add the leeks, onions, bay leaf and thyme and pan-fry over low heat, stirring occasionally, until softened and translucent. Pour in the wine, cover and simmer for 12 minutes. Beat the eggs in a bowl, then stir in the milk and Gruyère cheese. Mix the leeks and onions with the cooked rice in another bowl and add the egg mixture, then season with salt. Spoon into the prepared baking dish and bake for 30 minutes, or until the center is puffed and the top is golden. Meanwhile, make the sauce. Remove and discard the seeds from the pepper and coarsely chop the flesh. Put the pepper and stock into a food processor and process to a puree, then pour into a pan and bring to a boil. Simmer for 2 minutes. Stir in the cream and heat gently but to not let boil. Season with salt and pepper. 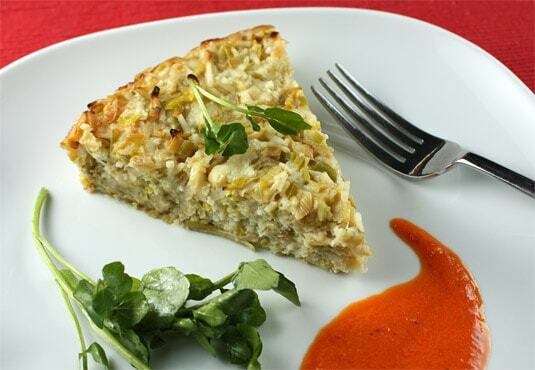 Turn the leek tart out onto a warm serving plate and serve immediately, cut into slices or squares, serving the sauce as accompaniment. This looks like such an interesting book. The cover page does not look too elegant but i like your review of the book. So, i might order it…. Aaah, moi qui suis une totale fan des tapas parce qu’on peut manger à notre appétit et goûter la diversité, Marie il me faut ce livre! C’est vraiment un livre super – tu connais Phaidon, aussi délicieux pour les papilles qu’à l’oeil. were in Barcelona the tapas were a highlight of our stay.